When Jurassic Park was released in the summer of 1993, it had several enticing aspects to draw in audiences. There was obviously the Steven Spielberg + dinosaurs angle, as well as the groundbreaking visual effects that made it feel like nothing we had seen before. At its heart, the Jurassic Park films are creature features with a unique wish fulfillment: what if you could visit an amusement park and hang out with real dinosaurs and then almost get eaten by them? Twisted, yes, but certainly entertaining. In the original trilogy, the raptors played prominent roles and were big hits with audiences. The sequence in which the raptors trapped the kids in the kitchen is an all-timer. They even named an NBA expansion franchise, the Toronto Raptors, after them. However, the raptors were essentially antagonistic – frightening monsters that were cool, but also extremely deadly. That being said, while Jurassic Park t-shirts and dinosaur themed extra-value meals at McDonalds were a thing, there wasn’t a huge merchandise crossover with the films because we basically never got to know these creatures. When Universal and Amblin Entertainment put together 2015’s Jurassic World, two significant changes were implemented: the park was fully functional with loads of guests and we got to know specific raptors with names. The second detail seemed on its face to be a direct effort to sell merchandise; which makes sense, as you could buy any sort of plastic dinosaur toy at Target or Walmart, so why would you pay more for a toy that has JW painted on its hind leg? You would if you felt an emotional connection to Charlie, Delta, Echo and the beta of the group, Blue. However, the decision to give Blue a significant character arc isn’t simply a cash grab for that sweet toy revenue. Instead, it’s a way to set Jurassic World apart from the previous films. By giving Blue the dilemma of siding with the Indominus Rex or the humans, the franchise made a crucial shift: the dramatic action will now be driven by character rather than concept. 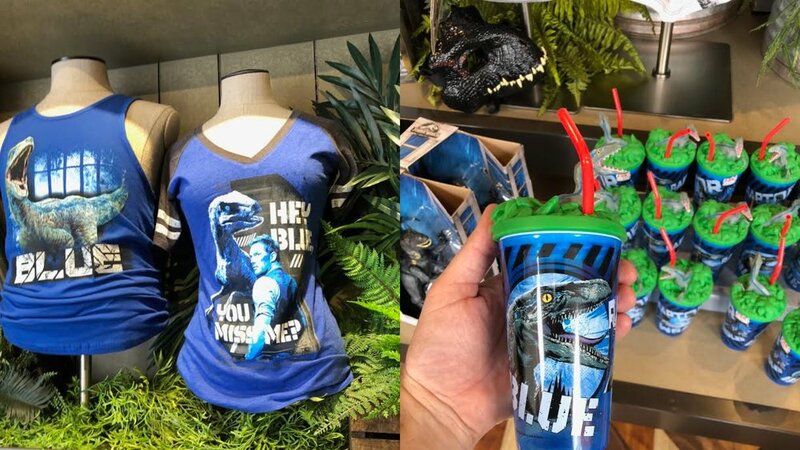 Audiences promptly fell in love with Blue the raptor and Universal picked up the cue without hesitation, giving her a plum role in the sequel, Jurassic World: Fallen Kingdom. But why all the love for Blue? Again, it’s back to wish fulfillment. Owen Grady (Chris Pratt) connected with Blue as if she was a trusty dog; which is what we secretly want, to be buds with a raptor. It also doesn’t hurt that it’s quite easy to pick Blue out of a lineup (with her blue stripe running from her head to her tail). But what other aspects of Blue’s characterization can you name? I’ll help: she’s feisty, sassy, and has a strong bond with Owen. Now, is that enough? Well, what’s key to Blue’s character arc is that she’s a survivor that wants revenge for the death of her siblings. And even bigger than that, Blue is a hero that took the side of the humans in order to save them. Of course, most of this happened in the third act of Jurassic World, which didn’t give too much of a warning that this character was going to be a major factor in the franchise going forward. Film Twitter has been a bit skeptical about this move to make Blue the face of the franchise, as it appears to be unearned, similar to the ill-fated Dark Universe that is only a year old. It’s as if the producers are telling the audience, “I know you came to see dinosaurs eat humans that you don’t like, but you will care about Blue. You love Blue. Now have some Doritos with his face on them.” There’s a particular viewer out there that needs this love affair to feel organic. They want to choose to love Blue, not the other way around. I believe that the choice to make Blue a character that we can have an emotional connection with is ultimately a smart and satisfying play that will hopefully yield interesting turns in the franchise going forward. Put your expectations aside; Spielberg’s sequel is a well-constructed mix of terror and playful joy. A case is made that Joe Johnston’s film is the best of the Jurassic sequels. Rain, rain, go away. Come again another day...Actually, today's fine. Sean takes a look at a number of sci-fi films which deal with the disorientation of time and space.